Yes, we really are sisters. We’re collectors and dealers of mid-century vintage goodness–from kitchenware to linens and beyond. If it’s colorful and reminds us of our childhood, we’ve probably snapped it up. Then we make it available to you! It’s the world’s most fun version of Catch and Release! 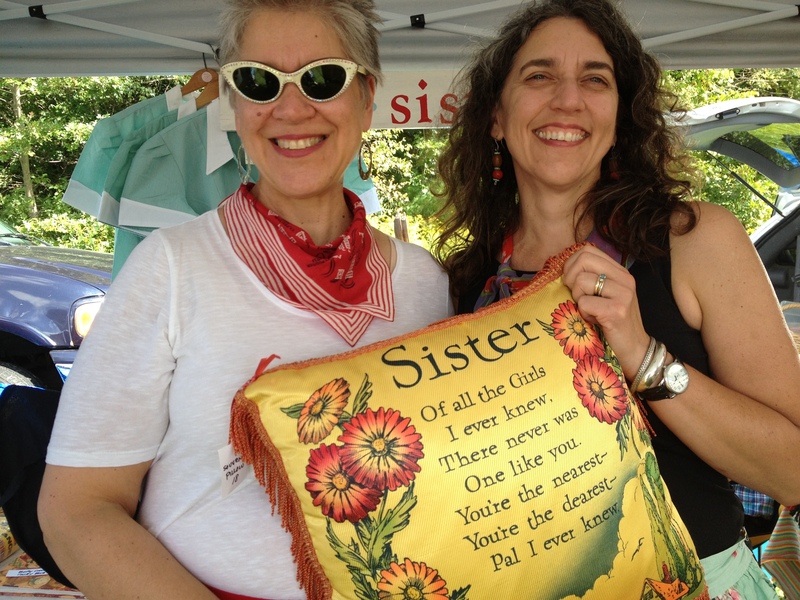 You’ll find us at Pettengill Farm’s Vintage Bazaar twice a year and at other fun venues. Etsy will probably be next. We’ll keep you posted. Janeray (Ilona) lives in PA and has amassed a hoard of Fire King jadeite in the Janeray pattern. Sorry kids, I got it when you were still in grade school. That was before Martha Stewart made it trendy and prices went through the roof. They’re my everyday dishes. I put them in the dishwasher (gasp!) but not the microwave. After 20+ years they’re relatively unscathed. Wish I could say the same about me. 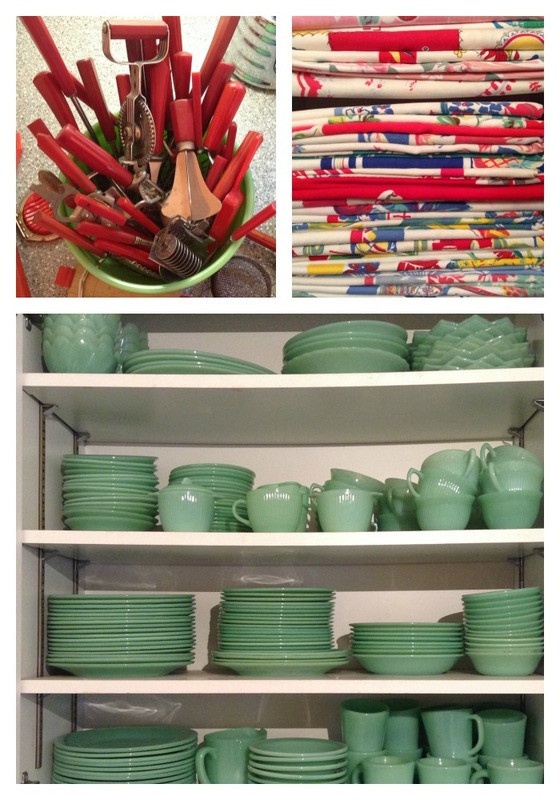 Just SOME of my jadeite, tablecloths and kitchen utensils. I have other dish patterns which I rotate between my china cupboards and storage totes. I also have a weakness for kitchen utensils with red Bakelite handles, vintage tablecloths and old mirrors. No, it’s not because I’m narcissistic. I live in a 1940s row house with windows only on the two ends. It’s a bit like living in a tunnel. Mirrors are my make-believe windows. They’re also more attractive than the art I can afford. Luray (Suzy) lives in MA and collects Luray pastels by Taylor Smith & Taylor. Luray was the 1930s alternative to hot Fiestaware, and I love its soft colors. They’re not my everyday dishes, though. Vintage Buffalo china restaurantware is in my kitchen cupboards,’cause that milkshake-cream color goes with everything—Luray included—and it’s indestructible to boot. Along with vintage dishes, I adore anything at all that’s silvery-shiny. Mercury glass, silver glitter, old mirrors. vintage pewter—it’s all here. Oh, and old table linens, and vintage pottery with that matte glaze. And I have a weakness for wooden rollercoasters. It’s weird how alike janeray and I are, despite having lived far apart from each other our entire adult lives. On the other hand, we felt sorry for kids whose parents actually had to go out and buy(!!) matching new furniture. We were exceptionally fortunate to have parents that modeled impressive Do-It-Yourself skills: carpentry, painting, sewing, leather work, metalworking, embroidery, knitting, crochet and more. Just about anything could get repaired or assembled in the basement workshop. 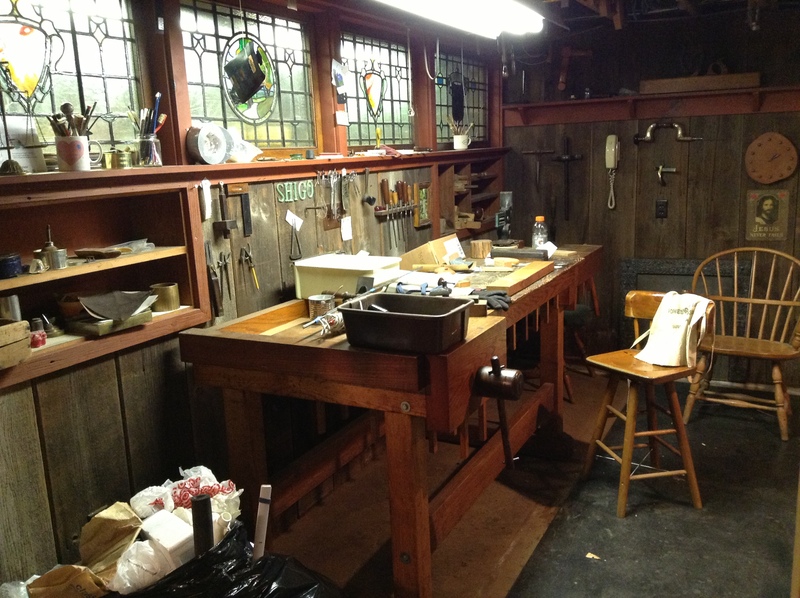 Our father’s workshop before it was dismantled and the house was sold. We were endlessly creative with cardboard, masking tape (LOTS of it! ), fabric, yarn, and whatever else we could get our hands on. We didn’t need kits, we had more than enough imagination to dream up projects on our own. Over the years we learned to love and value old things—things that were beautiful and well made, things that were hand crafted, things that were one of a kind. We learned that value has nothing to do with age and that style is more interesting when it’s yours alone. That esthetic has carried over into our own adult lives. We also became avid flea market and thrift store shoppers and aren’t afraid to mix old with new. We love color—truly, madly and deeply—and it’s reflected in the way we collect items and decorate our own homes. Stick around and join the fun, just don’t knock over the paint. Oh, and hands off the jadeite. Thank you! We inherited the Slightly-Off-Kilter gene from our dad so we might as well run with it. Thanks for stopping by our painfully new blog! Thank you! We’re having a great time putting it together, though in all honesty we had no idea how crazy we were to launch off with Month of Makeovers. I’ve never heard of Jadeite before now, but it’s beautiful! Lucky you to have such a nice collection now that it’s become “cool” to have. Funny how that happens. I do have a few pieces of Bauerware that I remember my grandmother had tons of… wish I had more of that. Hi, Kerri! Thanks for stopping by and for following! I remember when jadeite was “that ugly green glass” flea market dealers sold for next to nothing. (Showing my age! )I haven’t seen any vintage Bauer pottery for the longest time. Good luck hunting it down! Hi Linda! Thanks for stopping by-and good luck with shrinking your vintage hoard! Awhile back, I experienced the tragedy of a house fire. I lost almost all of my dishes. In thinking of replacing them, I decided I wanted something durable … and a childhood memory of dishes in cafes came to mind. I began google-searching and learned more about restaurantware. I fell in love with white undecorated Buffalo China – specifically with the raised logo on the back! As my home was being renovated, I began building my collection. Along the way, I have also added a few pieces of caramel-colored Shenango restaurantware. And, inspired by my mother’s mixing bowls and the bowls I always ate oatmeal from as a child, I’ve collected some interesting pieces of FireKing Jadite. 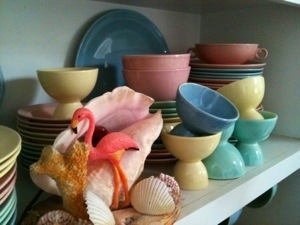 I’m so looking forward to displaying these dishes on the open shelving in my “new” white kitchen. All that is old will be new again.